NOLYTH portable External CD DVD drive,supports Mac/MacBook Pro/Air,PC,Ultrabook and Netbook etc.We have designed a new appearance and connection mode,which can be used in USB and USB C interface computers. NOLYTH external cd player is with the advantages of high quality, high compatibility,high performance,strong stability,high speed,our usb dvd drive wins customers' approval.Meanwhile,it has embedded unique burn prevention control chip,which can effectively prevent breaking the disk and gets super read disk error correction function while burning.This item can help to back up your data and enjoy the high-fidelity sound quality DVD and CD which is burnt from our external dvd writer. It can read CD, DVD, VCD and other formats disks. 1.NOLYTH usb-c superdrive provides faster data transfer speed,up to 10Gbps.It is backwards compatible with USB3.0/USB2.0/USB1.0. 2.Made of all-Aluminum Alloy,unique configuration design,Easy to install,Plug and Play,No Any Driver Required(Excluded Windows 98SE). 3.NOLYTH external cd writer supports to read CD,VCD,SVCD,CD-R,CD-RW,DVD-R/DVD-RW and write CD-RW,CD+RW,DVD-RW,DVD+RW etc. 4.Once order the usb cd drive,you will get a free drive storage case and usb3.0 adapter with high quality. 1.NOLYTH dvd player is normal usb dvd drive,not a blu ray dvd drive,so it can't play blu ray disc and work for iPad. 2.Please make sure the laptop is with sufficient power supply,a low capacity may cause the cd player can't be recognized. 3.Date transfer speed is also affected by computer and system environment. 4.The new released Windows system have discontinued the internal DVD media player software, customer using Windows 10 and above are advised to Install VLC Media player to Play DVD and CD. 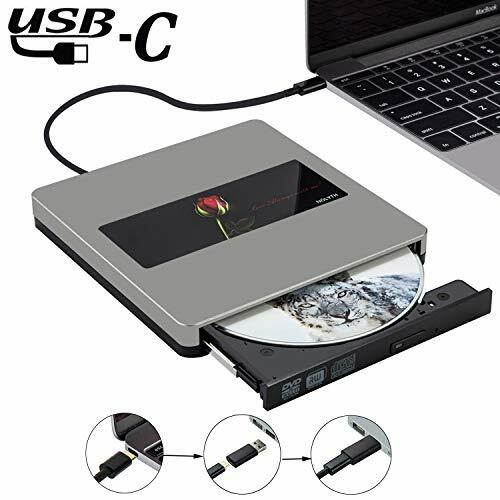 ※【New Design USB C】This is a new design usb c external cd dvd drive compatible with Apple/Mac/MacBook Pro/Air/Laptop/PC.Powered by USB C/USB port and embedded cable design, made with Aluminum Alloy material of shockproof,low noise,anti-interference and high durability.Works well in burning, writing and reading.No driver program or extra power supply required.Don't need to install software to set for driver. ※【Easy to Use】It is very easy to use,just plug and play,you just need to plug this external dvd drive into your USB C/USB port and the DVD drive will be detected.NOLYTH external cd drive is a perfect companion for computers without the internal drive.You can burn files,install software and create a backup CD.This CD DVD burner allows you to watch DVD/CD movies with no lag and burn music, movies to CD or DVD at any time. ※【Widely Compatible】 NOLYTH external cd burner works with Windows 10/7/8/Mac OSX/XP/Vista,all Version MAC OS.Specially designed to compatible with Apple/Mac/MacBood Pro/Air/Samsung/ASUS/HP/Dell/Sony/Acer and other Ultrabook, Netbook or Laptop/PC without internal drive But with USB C or USB interfaces. ※【Warranty and Package】NOLYTH cd drive offered 60days full refund and 2 year quality warranty, technical support is available via:confolytech@outlook.com.When order this external cd player,you will get a free usb3.0 adapter and a storage case for this external optical drive. If you have any questions about this product by NOLYTH, contact us by completing and submitting the form below. If you are looking for a specif part number, please include it with your message.